Despite being a bit broken, it’s fairly clearly the mandible of a felid, given the shape of that one molar and the limited sockets for the missing premolars, suggesting something with a very reduced tooth count – something that most of you spotted straight away. The size is a bit small for a Tiger or Lion, it’s a bit big for a Puma or Cheetah and it’s not quite as robust as I’d expect from a Jaguar, leaving us with the likely identification of Leopard Panthera pardus (Linnaeus, 1758). So well done to joe vans and palreyman1414 for ‘spotting’ what it was (terribly pun, I know). Here’s a nice Leopard skull from the Grant Museum of Zoology collections to give a sense of scale. 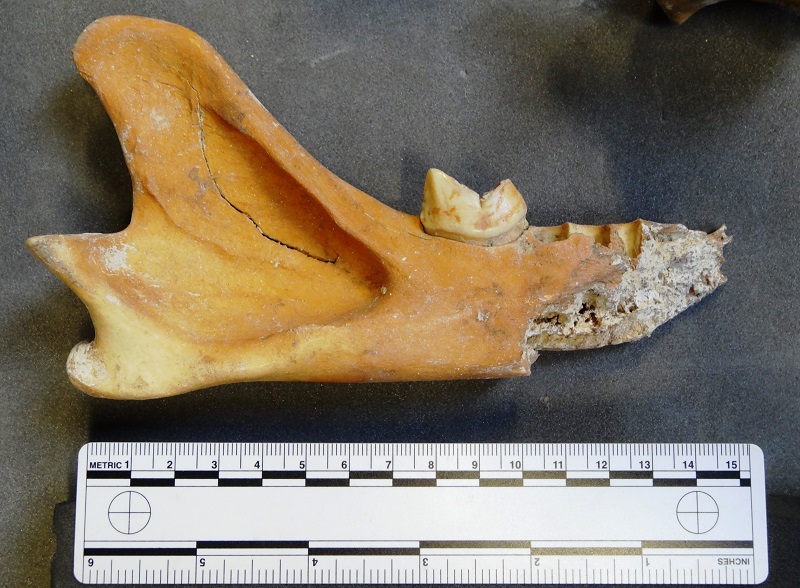 More mystery objects to come from the Grant next week, but if you’d like to see another specimen from the collection, my latest specimen of the week, that looks at the darker side of the Walrus might be of interest. You didn’t have much to go on, but most of you recognised that it’s a fibula (well spotted Ric Morris, Kevin, Mieke Roth and Flick Baker) and I was impressed by the variety of clever clues used to communicate that knowledge. However, Michelle went a step further and identified this as being from a large felid, in the size range of a Mountain Lion, earning loads of bonegeek points. It took me a little while to work out what this was myself, since it was in a box with Ostrich bones and my first thought was that it might be from another bird. 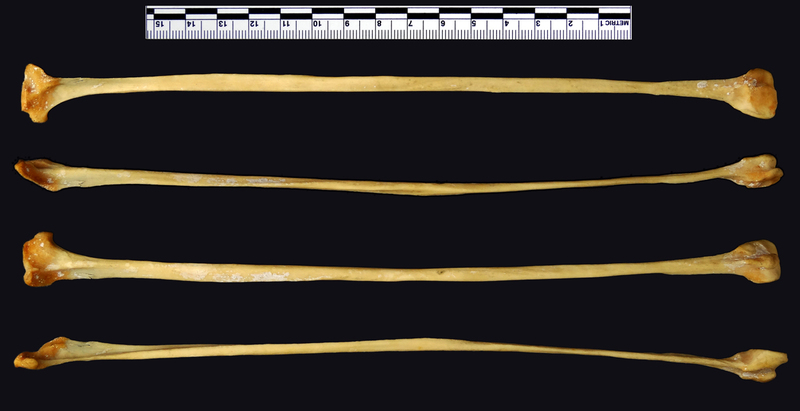 It has articulations at either end and a long midshaft, so it was obviously one of the long bones, but it’s very slender and wouldn’t be able to carry much weight on its own, so it was either a radius or fibula. I started by looking at the radii of a some large birds, like Albatross and Flamingo. However, on comparison with a few specimens it became obvious that I was looking in the wrong area, since the articulations didn’t fit with those on a bird radius at all. They also didn’t fit the shape of any mammal radius I could think of, so I started considering fibulae. I knew it couldn’t be a bird fibula, since they are fused with the tibiotarsus and would lack an articulation at the distal end, so I started looking at mammals. It was a bit slender for a dog, but pretty similar to a cat, if on the big side. Then I remembered that I had a box of postcrania from the same collection as the Ostrich that this bone shared a box with. So I checked the mystery object against that and was pleased to find that there was only one fibula in that box, it was from the other leg and it was a mirror image. So it looks like this bone has not only been identified, but reunited with the Cheetah Acinonyx jubatus (Schreber, 1775) skeleton it came from! For the last few weeks I’ve been using cat skulls as mystery objects, because they are really hard to tell apart and I was hoping that some useful distinguishing features might get spotted when you try to identify them. Any idea what fine felid this skull comes from? As usual I would really appreciate your thoughts in the comments section below – let’s see if we can crack this! I was a little suspicious of the identification attached to the specimen, but Al Klein suggested the same species – the Jaguarundi Puma yagouaroundi (É. Geoffroy Saint-Hilaire, 1803) [link opens pdf]. My reasons for suspicion were the nature of the post-orbital constriction (the narrowing of the braincase behind the eyes), the nature of the zygomaticotemporal suture between the temporal process of the zygomatic and the zygomatic process of the temporal bone (the bit where two bones meet to make the arch of the cheek) and the shape of the nasal bones where they meet the frontals (the V shaped bones above the nose area). 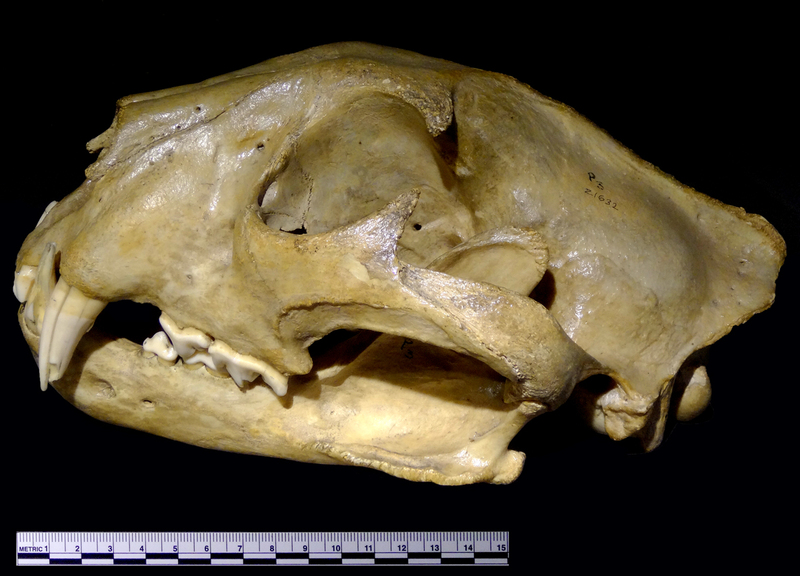 The observation by henstridgesj that the skull was similar to the previous mystery object (Leopardus tigrinus) was a good one, so I decided to research the genus Leopardus in a bit more detail, to see if there was a better match. 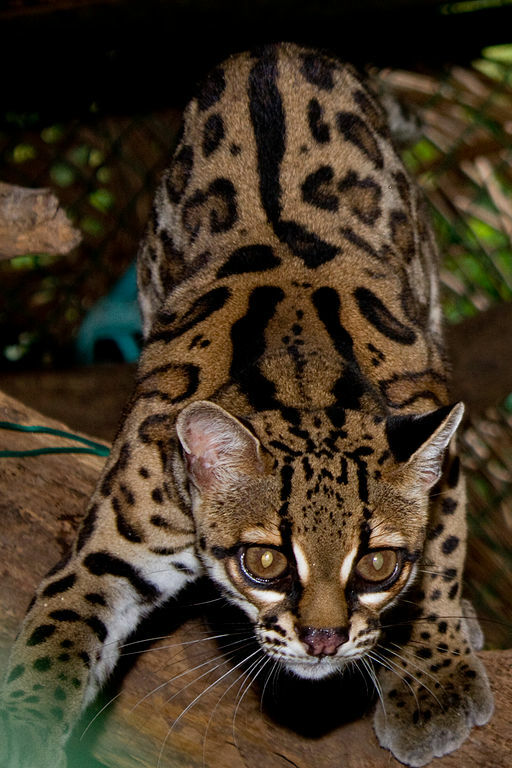 It turns out that the skull I found that matched this one most closely – especially with regard to the relative lack of a post-orbital constriction and the nasal-frontal junction – was the highly arboreal Margay Leopardus wiedii (Schinz, 1821) [link opens pdf]. 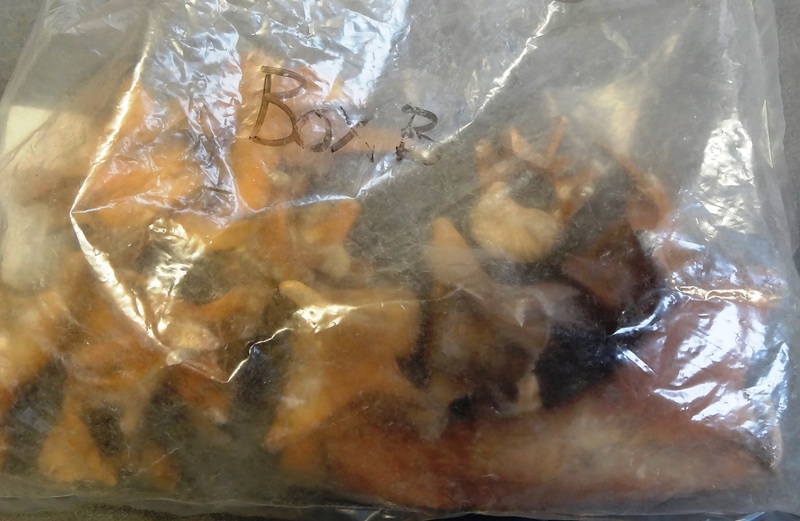 I’m always a bit reticent to re-identify specimens that have original labels from the supplier attached as this one does, but this comes from suppliers (Dr.s Schlüter & Mass) that I know have seriously misidentified or mislabelled specimens in the past (e.g. labelling a African Lappet-faced Vulture as an Andean Condor from Bolivia). 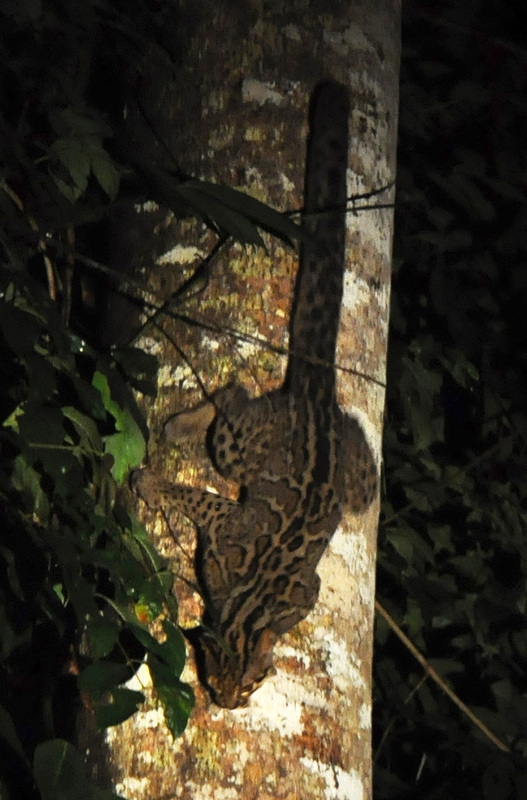 It is about the same size as a Domestic Cat and is very similar in morphology. But it’s not a Domestic Cat. The auditory bullae (the bulbs under the skull that hold the hearing apparatus) and the external auditory meatus (ear holes) are a bit bigger, the skull is a bit broader and the interpterygoid notch (the gap at the back of the palate that the airway emerges from) is squarer and has a slight ridge in front of it on the palate (and I’m not sure that ANY of these are particularly significant). 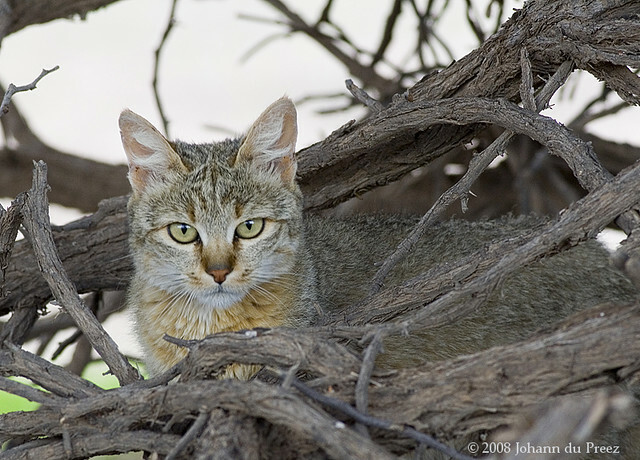 There were plenty of suggestions about what this skull might belong to, but only henstridgesj hit the nail on the head with a correct identification of Southern African Wildcat Felis silvestris cafra Desmarest, 1822. So well done Stephen!